How the pros make Overwatch's hit-and-miss DPS work. 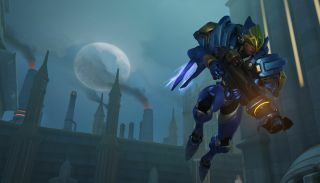 When it comes to effective and diverse off-meta play, Pharah is one of the most popular DPS picks at both the ladder and esports levels. From distracting support to forcing counter-picks, having a good Pharah in the sky can open many tactical doors that would otherwise remain closed. Don’t be fooled by the one star difficulty: she offers the discerning player a deep and challenging experience. People of every experience level choose Pharah for pretty obvious reasons. Her aesthetics are awesome, she has a rocket launcher, and, of course, she can fly. But just because you can soar through the sky doesn’t mean you should drop a skill-based approach in favor of a luck-based one. You’re more than a hovering missile turret with a limited lifespan. If you find yourself struggling to stay alive or contribute in a meaningful way, scale back your approach and realize a couple of things. For starters, that left-shift is very attractive indeed. Shooting up into the air is one of the more thrilling skills in the game, but it also leaves you vulnerable to basically everything if you aren’t careful. Don’t be 'that guy' who immediately uses Jump Jet out of the gates only to be obliterated by Widowmaker, Soldier 76 or even Ana within seconds. Look at who the other team is fielding and use cover accordingly. In the following clip, watch how Renegades’ Mangachu hovers around a wall at the Garden stage of Lijiang Tower before lifting off. Once you have an appreciation for Pharah’s 200 HP and her limitations in the sky, you’ll be able to make much more deliberate and effective attacks. Instead of choosing obvious routes, channel your inner Genji and find unconventional paths to better strike at your enemies and demand their attention. Dorado has a ton of rooftop options that allow for this. Here, Mangachu decides to flank the right side of point one using a rocket jump and a Concussive Blast. Notice the slight pause as he lets the encounter develop for just a couple more seconds before engaging. Once Renegades push just past the bridge, he goes in for a yo-yo attack that kills a healer and distracts two tanks, allowing ManofSnow (D.Va) to recover some health. These are the sorts of small, vital decisions that you have to make with Pharah if you want to be successful. As tempting as it is to jump up to max altitude and suppress with rockets, there will always be better options. We’ve all been in ladder matches where there’s incessant moaning about character choices before the round starts. There are many viable compositions in most lower league games, so hear people out. Likewise, if you want to get the most out of your Pharah time, see if you can’t nudge some people into an aggressive dive composition. That is, a selection of characters designed to inflict a ton of damage in a short amount of time. Mercy is crucial for this to work well for you, as the infamous “Pharmercy” battery is one of the most difficult duos to counter in the game. If someone is willing to compliment this with Winston for a distraction, that’s even better. Here’s a perfect example of how this can play out, courtesy of Misfits from OGN Apex. Zebbosai and Nevix fly out to meet LW Blue in front of the lighthouse on Ilios. Using the middle building for cover, they reveal themselves just as the opposing D.Va unknowingly flies out of position. With no hard counter, they attack with impunity and nearly get a team wipe while Winston, Genji and Tracer harass on the ground. One little detail you might have missed is at the tail end, where the enemy Reinhardt has no choice but to pivot toward Zebbosai, exposing himself to the rest of Misfits who have him surrounded. That move will get you some ladder points without a doubt. Pharah’s Barrage is one of the best ultimates in the game. It’s loud, flashy, and does a boatload of AoE damage. There are always drawbacks to these sorts of skills, and for Barrage, it’s that Pharah must remain stationary until the ability’s animation is over. Because of this, you might find more success using your ultimate at lower altitudes, even if you only get one or two kills. Like Mercy’s Resurrect, it’s often more beneficial to use it when you’re 100% positive you can get a couple, rather than wait for an elusive opportunity that may never present itself. Watch here, as Kongdoo Panthera’s Rascal counters a Tactical Visor with a Nano-boosted Barrage. Communication like this is rare on the ladder, but it’s certainly not unheard of. Since you likely aren’t a major Nano target for most Anas, let them know you want it. Nano-Barrage is the unicorn of DPS ultimates, but it’s devastating when it lands. Alas, you will inevitably find yourself in situations where neither flying nor flanking will do you any good. Anything from spawning issues to payload movement could put you in such a spot, but Pharah actually does pretty well for herself in these sorts of lulls. Her rockets do a considerable amount of damage to Reinhardt’s shield, so by all means, unload on it like Zebbosai does here and keep people pinned down. No matter if your goal is to “main” Pharah or be a point specialist, you’d do well learning the intricacies of every map and which characters will put you down in a heartbeat. If you force a McCree or Soldier 76 spawn in the middle of a fight, you’ll need to be honest with yourself about your abilities and make the right choice after testing the enemy a little bit. Moreso than other DPS characters, a Pharah who can’t stay alive is a big liability in close matchups. Use cover, communicate with your team, and have fun raining justice from above.